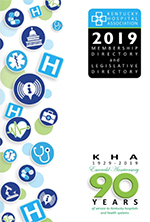 KHA strives to keep all members apprised of Association activities, health care news and government actions which affect hospitals. The Association also creates several special publications that support hospitals in sharing their story with legislators and the public. Find links to all our regular and special publications under "Services" on the website. KHREF administers Hospital Preparedness Program (HPP) grant funds for equipment, training and assistance to 13 regions. The regions are responsible for developing regional plans to respond to a chemical, biological, radiological, nuclear or explosive event, as well as natural disasters such as earthquakes and severe weather, which could cause multiple casualties. Resources, newsletters and more are available on the Emergency Preparedness section under "Services" on the website. KHREF has also acted as the lead organization in the state to coordinate and support the development of the Kentucky Trauma Care System, since enacted in 2008. KHREF works closely with the Kentucky Commissioner of Health, and an appointed Kentucky Trauma Advisory Committee. The trauma system has grown from three verified and designated Trauma Centers, to over twenty facilities, which have voluntarily stepped up to meet the higher standards of care required to handle the severely injured. The general moto of the Kentucky Trauma Care System is: "Right Patient; Right Care; Right Time," meaning that the focus is to quickly identify those who need a higher level of care, get them to the most appropriate facility best equipped and staffed to deal with their injury, and do it in as short a time as possible. For resources, visit the Kentucky Trauma System section of the website, under "Services."